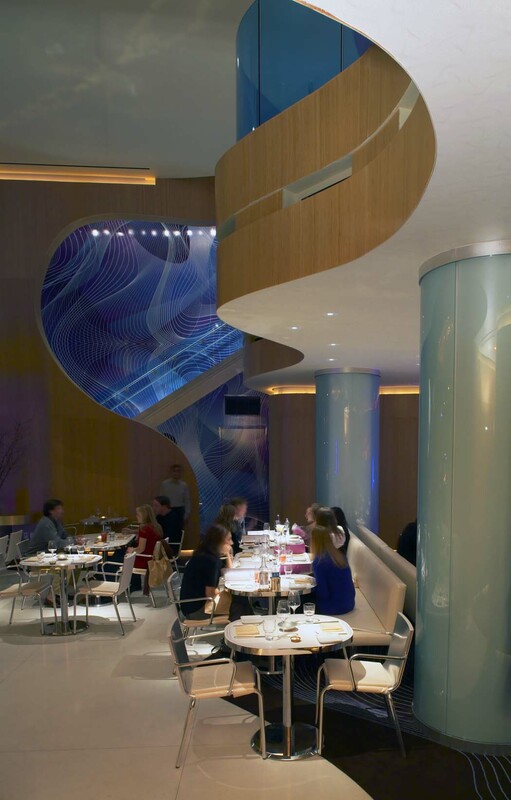 The interior of Market at the W Atlanta-Buckhead. A spirograph may have been the inspiration for some of the artwork. I’ve just about abandoned my search for a hoop skirt with shot glass attachment. And I had such great plans for it. 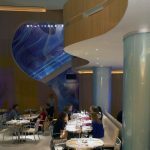 My desire for said skirt began when I attended the reality-TV-show-star-studded opening of the W Atlanta – Buckhead last month, where we were greeted by a young lady sporting such attire. Her entire hoop skirt was made of rows of metal shot glass holders, each containing a delightful beverage. Although movement would be severely restricted, I figured it wouldn’t matter, because with such a garment, the party would come to me. The fact that hoop skirts do wonders for hiding any wiggly bits below the waist is just a bonus. But I console myself that although I may not be able to duplicate that outfit, I am able to duplicate the W experience itself, just about whenever I like. Atlanta now has four W hotels, with three new ones opening just in the past year. And each of the three new hotels has its own amazing, totally different restaurant. Midtown has Spice Market, serving Asian cuisine, Buckhead has Market, serving classic dishes with fresh, local ingredients and downtown has BLT Steak. 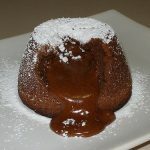 The molten mini cake. I am nominating Jean-Georges Vongerichten for sainthood for its creation. 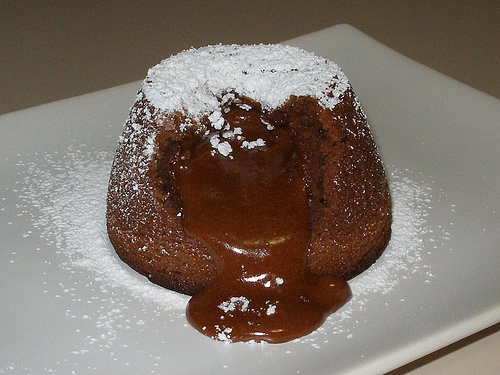 much-copied warm molten chocolate cake. These mini cakes are beautiful on their own. Then you take a bite, and a thick lava of delicious, chocolate oozes out on your plate and the portion of your brain that counts calories temporarily shuts down while you devour every last morsel, sliding your finger along the plate for that last bit of chocolaty goodness. In addition to the always-accommodating whatever, whenever policy, which I wish many more people in my life would adopt, I love the casual sophistication of each W hotel. You know how when you play a competitive sport, it’s best to play with someone a bit better than you to up your game a bit? That’s the way I feel when I walk into a W. They are more sophisticated than I am, but going there ups my game. I feel just a bit more casually elegant myself. Another thing I love about the W? The service is helpful and genuine, without being overbearing. I was there again today, for example, to pick up the coat I left behind at lunch yesterday. The same coat I left on a plane at in the Punta Cana airport last week. That rescue mission was way more complicated, involving several non-English-speaking staff of the airport, including one uniformed young man who insisted I walk five steps behind him back to the security line where banana-hatted ladies insisted on taking my photo because who wouldn’t want to preserve this magic moment? Anyway, everyone at the W greeted me warmly, including the helpful valet guy who attended my car while I ran inside. So I may not get my hoop skirt, but I do know where to get molten chocolate cake and kind attention. Whatever, whenever.